These will give you the chills! 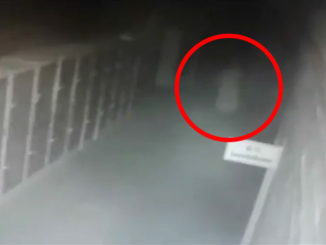 Here are 10 ghost sightings caught on camera that will give you the chills. From spirits haunting the halls of old hospitals to a ghost train spotted in Russia, we count 10 terrifying ghost sightings caught on camera. This is some chilling footage captured in an old hospital in Honduras. While visiting the teaching hospital at night, a student heard some strange noises and decided to start filming. In the clip we see a dimly lit corridor with several stretcher beds lined along the walls. Out of one of the doors a disembodied head suddenly appears. It looks at the camera for a second then retracts behind the door. It appears again and begins to lurch down the hallway with a strange limp. The student, who must be terrified, retreats into a darkened room. Reports say that the hospital is haunted by a doctor who took his own life many years ago. Students and visitors often give accounts of strange shadows, lights flickering and an eerie feeling of always being watched. Could this be the spirit of the doctor who tragically committed suicide all those years ago? This strange clip was uploaded to Youtube in 2013. It’s allegedly taken from a security camera in the Russian metro station Polezhaevskaya. In the footage we see a transparent train pull up to the platform during what looks like a fairly busy period. You can see passengers walking on the platform on the far right, however they don’t seem to take any notice of the ghostly train. The translucent locomotive seems to let off several shadowy figures before taking off down the rail line. What could this be? A clever editing job or a ghostly imprint of a train from years gone by? Could this be an elaborate set up with strings pulling the shopping cart? What do you think? Let us know in the comments below. 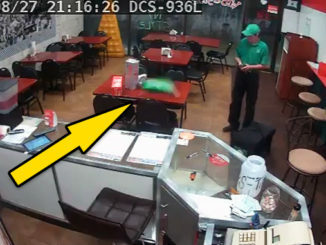 This is some really creepy footage that started spreading around the Internet in 2015. The clip was filmed by two guys looking out the window of their apartment. They started filming when they noticed a strange figure walking through the graveyard adjacent to their apartment block. 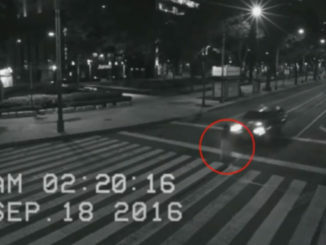 In the footage we can see what appears to be a lady dressed in white. She walks eerily from tombstone to tombstone touching her head against the graves. The two men try to get her attention by yelling out but she takes no notice. At one point she takes a flower from one of the graves, smells it, then walks somberly through the yard. She even begins skipping and dancing on one tombstone to the next, completely oblivious to the world around her. Finally, she walks behind a large gravestone monument and disappears completely, never to be seen again. The two men continue filming for some time but fail to spot the eerie lady again. 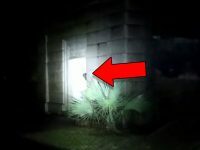 This footage was captured by paranormal investigators after they were called to search a suspected haunted house. The house, located in Rowlands Gill, England, is notoriously haunted and known by local residents as a paranormal hotbed. Paranormal investigator, Terry Johnson was asked to perform a study on the house to see if they could find any evidence of a haunting. Terry and his crew set up several cameras around the house and at around 10:20 pm on the Sunday night, they asked for the spirits to reveal themselves. Moments later, a chair moved on its own right in front of the camera. If you take a look at the footage you can see some strange lights and orb like objects floating around the room. Then suddenly the chair moves. After being interviewed by the Newcastle Chronicle, Terry said he was ‘gobsmacked’ by what they had captured on film. 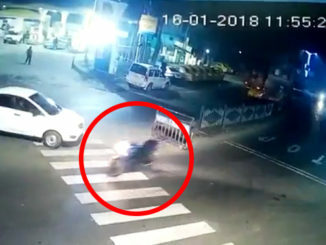 Since then, the footage has been spread around the internet causing a lot of discussion on social media. 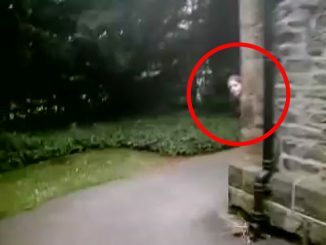 Many find the footage a little too convenient, calling it a hoax while others believe it to be genuine evidence of the existence of ghosts and an afterlife. This film is definitely proves the home security camera benefits as without this video, we wouldn’t have any ghost footage.